Do you find yourself competing for subscribers against free or low-priced content? What if you had to compete against the Wall Street Journal, Investors Daily, Financial Times, Barron’s, MSNBC, Yahoo Finance and thousands of other paid and free resources. Dan Fink, managing director of Money-Media, offers innovative solutions and lessons learned from his years of competing against some of the biggest publishers in the world, and winning. I recently interviewed Dan for my Membership and Subscription Growth podcast. In a world where everyone is playing on the same connected stage, Dan can show you how to compete (and win) against the biggest publishers in the world. Dan says the first step is to “Make sure you have a product concept, a market, an audience that you can serve really well.” Forbes and other financial publications are essentially marketing to the same consumers, but Money-Media distinguishes itself by targeting a specific audience and offering content that is not easily available anywhere else. One of the challenges in subscription sales is getting your product to the person or people that have the money and the authority to make the decision. Dan’s team learned over the years that most corporate boards have a specific liaison within the company who control the majority of the communications that goes out to the board. The board will usually reach a decision by consensus, so the old sales question “Who makes the decision” is not really relevant. Instead, ask your lead contact if they would like a personal free trial subscription. Once the publication is in the hands of this person acting as “gatekeeper” for board communications, the content should sell itself. When the trial is over, Money-Market converts these free subscription l to sales by only offering licenses to corporations – not individuals. This motivates the gatekeeper to reach out personally to the people who make the decision and have the budget to purchase subscriptions. “It’s really about having a 365-day mentality that if you’re going to try and renew these people a year later, your job starts in day one to make sure that they have a good experience all year long. And then the pressure’s off when renewal time comes. Find out more about Money-Market’s products at money-media.com. You can find information there on each publication and link through to a free trial. 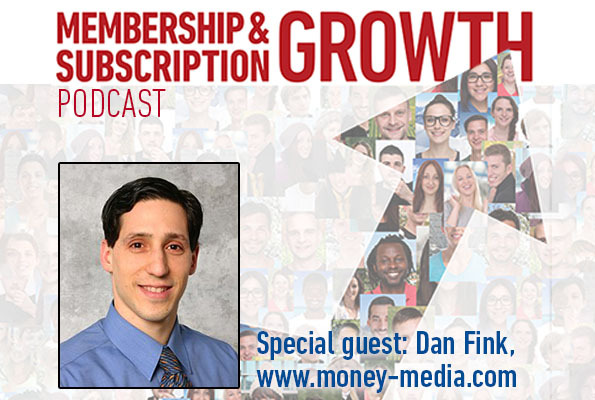 Listen to the full interview with Dan on the Membership and Subscription Growth podcast.